Life, Liberty and the Pursuit of Good Eating. All You Need Is: CHOCOLATE! Let’s face it. Who doesn’t like chocolate? It’s the world’s most iconic sweet, the cure for a love sick heart and the epitome of romance. It gives us warm fuzzies and makes us feel loved! Speaking of love and chocolate: it’s almost Valentine’s Day! Chocolate is a scrumptious treat for the “day of love”, not to mention an amazing aphrodisiac! But… grabbing a box of chocolates from the store, while it may taste great, is not so great for your body. The chocolate itself is full of iron and antioxidants, but the sugar inside is just waiting to bog you down! Today I whipped up a batch of homemade chocolate that is not only simple, but better (in my humble opinion) than anything you can get at the nearest grocery store. Whether you’re going out or staying in, below is the perfect recipe for a perfectly divine dessert. Not only does it tastes amazing, it is absolutely guiltless! Does it get any better than that? Line a dish or baking pan with parchment paper. Then, using a spatula, empty batter into pan. Be sure to spread the chocolate to all edges, evening out the top. Optional: Sprinkle sliced almonds or crushed pecans or walnuts on top for a little crunch. Mm! Pop in the refrigerator for about an hour, or until firmly set. 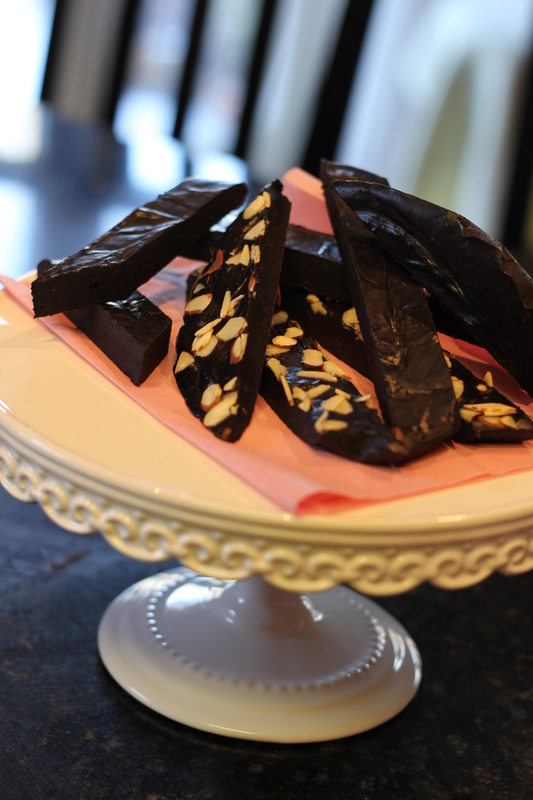 Delve into your homemade, guilt-free, chocolately goodness!